Would you like to offer a sense of spaciousness to someone you love, or create the opportunity for them to connect with their own sacred interiority? We are offering two upcoming chances to dive deeper on this inward journey, a guided 6-week meditation experience and a winter retreat. If either of those call to you, you can learn more here. I love the respect that Mary Oliver has for the dreaming time, the inward time, the fertile darkness of turning inward. 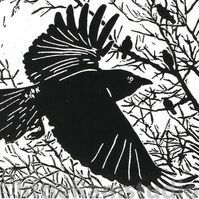 The crows can fly, she suggests, because they spent all night dreaming of how they would like their lives to be. We value action so highly in this culture that it can be difficult to allow ourselves this very necessary inward time. Thank you for taking this time for yourself. Thank you for taking the time to listen, and reflect, and dream. I believe this inward, reflective time is when we create soul, and I believe this world is hungry for soul. I know that I am. So, again, thank you! The dream is the small hidden door in the deepest and most intimate sanctum of the soul, which opens to that primeval cosmic night that was soul long before there was conscious ego and will be soul far beyond what a conscious ego could ever reach."